Today, the Nerdist released the announcement of the upcoming young adult novel "Ahsoka." The LucasFilm press release was featured on their site. One thing that this press release does not mention, is whether or not this novel is based on or adapted from the untold Star Wars: The Clone Wars episodes featuring Ahsoka. Yesterday, a Dave Filoni in an interview with Eric Goldman was released at IGN. In the interview, he said that the final story arc of the Clone Wars would have featured Ahsoka facing off against Darth Maul. "It is the last story arc of the Clone Wars TV series that we were doing, was this story about Ahsoka and how she crosses with Maul. What was significant about that was that it was the story that was really going to draw her possibly back into the Jedi Order, because the motivation around this conflict with Maul was her knowing the personal history between Maul and Obi Wan, who was their dear friend. So she was caught up in that, and basically she says point, “The last time I saw Anakin, he was rushing off to save the Chancellor.” She was actually planning with Obi Wan and Anakin the capture and attack that would get them Maul, because she had figured out where he was towards the end of the Clone War. But before they can go through with this plan together, Obi Wan and at one Anakin get called away to Coruscant to save the Chancellor, which leaves her with Rex – and some other exciting characters – to basically go and deal with Darth Maul, once and for all. That’s kind of a good brief of what that was about." Read more at IGN. Alright. I'm gonna go out on a limb here and say that I think Disney is going to release a fully animated Clone Wars film based on Ahsoka's cancelled Season 7 and 8 arcs. I have no proof for this. Just my own conclusions (and, yes, hopes). I have two reasons to believe this. 1. Disney has declared the cancelled CW stories to be canon. They have also allowed those stories to be heavily referenced in other canon works (e.g. Rebels). This leads me to believe that Disney eventually plans on releasing all of those stories. This leads me into my second point. 2. 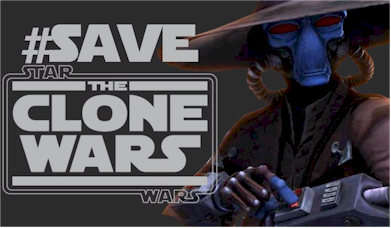 In the three years since TCW was cancelled, only 35% of the completed stories have been fully released. It doesn't take that long to make a novel, it doesn't take that long to make a comic book. Dave Filoni has stated multiple times that he hopes to share those stories one day. I think Disney was surprised by the large outcry over TCW being cancelled and the popularity of CW characters who have appeared in Rebels. I think everyone, Filoni included, was surprised by the response following Ahsoka's possible death. So what we have are a large number of canon, fully completed stories, that Disney fully intends to release, that are being inexplicably delayed if they are indeed only going to turn out to be comics and animatics. Maybe I'm wrong, in fact I'd say it's likely I'm wrong. But there HAS to be more than a small chance that something large is being planned for those unreleased stories. So here's my prediction: A 2018 Ahsoka film from the 7 and 8 story arcs.